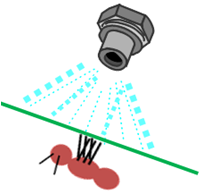 There are several ways that insect populations can become resistant to insecticides, and pests may exhibit more than one of these mechanisms at the same time. Metabolic resistance. Resistant insects may detoxify or destroy the toxin faster than susceptible insects, or prevent the toxin from reaching target sites by binding it to proteins in their bodies. 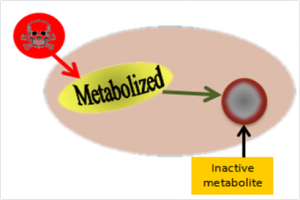 Metabolic resistance is the most common mechanism and often presents the greatest challenge. 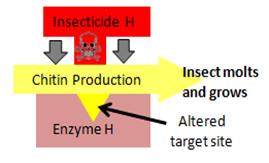 Resistant insects may possess higher levels or more efficient forms of the enzyme(s) that break down insecticides to nontoxic compounds. Behavioral resistance. Resistant insects may avoid the toxin by a change from their normal activity. Insects may simply stop feeding or move to the underside of a sprayed leaf. Some malaria-transmitting mosquitoes in Africa developed a preference for resting outside that prevented them from coming in contact with pesticide sprayed on interior walls. Penetration resistance. Resistant insects may absorb the toxin more slowly than susceptible insects. Penetration resistance occurs when the insect’s outer cuticle develops barriers which can slow absorption of the chemicals into their bodies. This mechanism is frequently present along with other types.